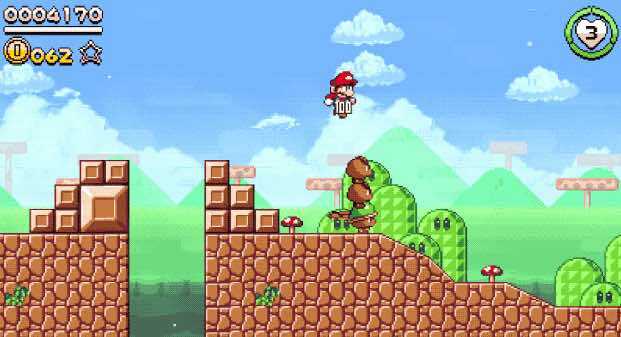 Super Mario Flashback is a fantastic fan made Mario game that brings gorgeous pixel art animation, catchy remixed tunes and a bunch of new moves to Mario’s classic 2D platforming gameplay. Previously featured on Alpha Beta Gamer last year when it was still just a Tech Demo, Super Mario Flashback is shaping up to be the greatest Mario fan game ever made (and in the running for being the greatest 2D Mario game ever made). The current build features three whole levels, each of which offer a nice test of your platforming skills and show off the fantastic work the devs have done on the game. When you first load up Super Mario Flashback what first strikes you is how wonderful it looks. There’s an incredible amount of detail and the character animations are gorgeous. The Mushroom Kingdom has never looked so beautiful. The new build allows the devs to show off new areas (such as an underground level), and to show off new enemies, such as the Hammer Bros and the most adorable looking winged Koopas you’ve ever seen (you almost feel guilty for stomping on their heads). As well as looking jaw-droppingly beautiful, the devs have also made a few tweaks to Mario’s classic move-set, with you able to break into an arms-out run (as in Mario Bros 3), wall jump, wall slide, power stomp/bounce and slide. You’ll need a lot of these new abilities to make your way through the levels too, as they can be pretty challenging at times. It’s a remarkable game and it’s clear the amount of hard work and dedication that’s gone into breathing so much life into the Mushroom Kingdom. A joy to behold and a dream to play. Highly recommended. Note: There is currently a bug which can cause the music of the stages to overlap. The devs are working on getting it fixed though.